The storm sequence from Richard Strauss‘s Eine Alpensinfonie, Op.64, captured in an aircheck from November 23, 1947. Dimitri Mitropoulos conducts the New York Philharmonic-Symphony Orchestra at Carnegie Hall. 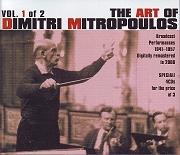 From Volume 1 of Music & Arts’ invaluable The Art of Dimitri Mitropoulos. The storm sequence from Richard Strauss‘s Eine Alpensinfonie, Op.64. Can you name the conductor (and orchestra) captured in this vintage aircheck? All will be revealed at 1500 EST on July 3. “Richard Strauss in the original tongue – Saxon!” My review of their all-Strauss program is live at ClassicalSource.com.